Just how white is Australian theatre? New stats released | Daily Review: Film, stage and music reviews, interviews and more. It’s long been said that Australian theatre is overwhelmingly white, with artists of colour not afforded the same opportunities as their Anglo-Saxon/Celtic counterparts. The issue was discussed at length late last year, when Australia’s theatre companies revealed their seasons. Some seemed to embrace cultural diversity — and the richness and variety of stories that follow in such a season — whereas others seemed rather narrow in their outlook. Cultural diversity in Australian theatre is not an area in which there’s been a great deal of data available, but a new report compiled by Melbourne-based writer and performer Kim Ho reveals where our biggest companies are succeeding and falling behind. The report looks at the main stage seasons of ten major companies in 2017. “I kept hearing the same kinds of patterns and stories where artists of colours felt their careers didn’t take off in the way that white artists’ careers did, and that they’ve been the subject of direct or indirect exclusion,” Ho told Daily Review. Of the 95 productions produced at Australia’s ten largest theatre companies this year, only four are written and directed by people of colour, while 70 are both written and directed by white artists. The situation is significantly better for writers of colour than for directors. 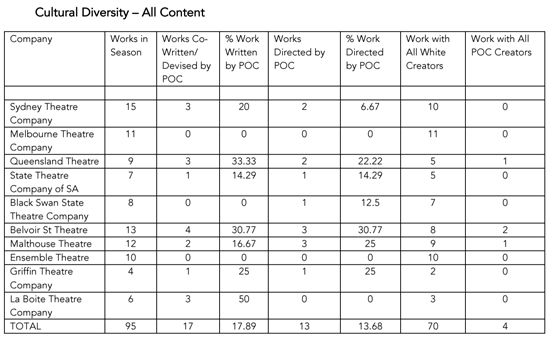 Less than one-fifth (17.89%) of all works are written by people of colour, but just 13.68% are directed by people of colour. Ho says that even though it’s less than one-fifth, he was surprised that the figure for writers of colour wasn’t worse. 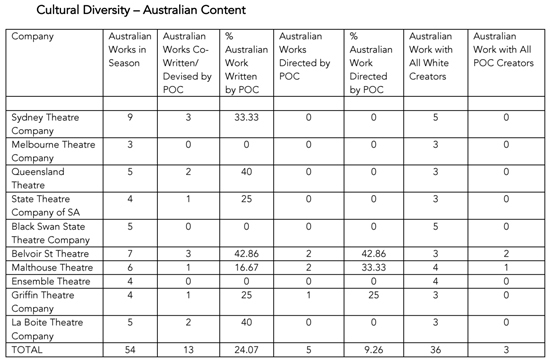 When it comes to the diversity of writers of Australian content, that figure is even better, with 24.07% of the main stage works written by a person of colour. Ho found that 34.73% of productions’ promotional materials featured at least one person of colour. Some theatre companies did quite well in representing the diversity of our communities: half the writers at La Boite this year are peole of colour, just over 30% of writers and directors at Belvoir this year are people of colour, while that figure is around 27% at Queensland Theatre. The results of other companies were less promising: both Ensemble Theatre in Sydney and Melbourne Theatre Company have solely white directors and writers in their 2017 main stage seasons. Melbourne Theatre Company does have a number of people of colour working in other areas — including an education show and the Cybec Electric play reading sessions. Ho hopes to continue his research into cultural diversity in next year and wants to look at the diversity of audiences. But given that theatre companies generally don’t collect any data on the cultural make-up of their audiences, it may be a particularly difficult task. But he points to Malthouse’s production of Little Emperors earlier this year, which anecdotally attracted a huge Chinese audience. Ho said that he’s never seen an Australian theatre audience like the one assembled at Little Emperors before, and that producing content which speaks to diverse audiences is key to broadening a theatre company’s reach. “When you see yourself so seldom onstage and suddenly have this show that’s enfranchising and speaking to you and your experiences, it’s incredibly moving,” he says. The full Cultural Diversity in Australian Theatre report can be viewed here. What percentage of the Australian population do people of colour make up? Rather than an indictment of the arts, wouldn’t this statistic about the theatre just reflect Australia’s overwhelming whiteness, which is the result of over almost a century of recist immigration policies? interesting stuff, and congratulations to Belvoir Street who, to this audience member, are doing much the best work in the country at the moment regardless of ethnicity (and the awards they’re winning tend to demonstrate the same).